The Christ child has been born of Mary, wrapped in swaddling clothes and laid to rest in a manger. The angelic host has winged its way back to highest heaven. So, what do we do now? The incarnation reveals a God who pitches his tent with the poor, the undocumented, the slave and the outcast. Infinite power takes up residence in a helpless child. And the child really is helpless. Minus the loving care of its parents, this spark of life would quickly succumb to cold, thirst and hunger. Perhaps this is why the parents-to-be were subjected to an extensive angelic interview. The risk of birth, demanded parents who could hold up their end of the bargain. The Bible doesn’t dwell on the Messiah’s formative years. Mark and John introduce us to a fully grown Messiah, and Matthew and Luke restrict themselves to a few childhood glimpses. Matthew reveals the subtle dance between the magi and mad king Herod ending with the slaughter of the innocents and the flight into Egypt. Thanks to mad king Herod, the Christ-child retraces the steps of a slave people, living in Egypt as an undocumented immigrant. The old man grasped what no one else, even mother Mary, could grasp: still a nursing child, the claim of God was on the life of Jesus. Only God would decide what sort of Messiah this baby would become. The next time we see Jesus, he is a remarkably precocious twelve year-old posing theological questions to the leading Rabbis of the day and weighing their answers with rapt interest. He is already wrestling with God’s claim on his life. Luke and Matthew move swiftly from birth to baptism, then treat us to a blow-by-blow account of what we call “the wilderness temptations”. This is where Jesus decides what sort of Messiah God wants him to be. The story reaches its dramatic high point when the devil takes Jesus to a high mountain and shows him all the kingdoms of the earth. All this can fall under Jesus’ power. The only catch is that the devil gets to decide what sort of Messiah Jesus will be. His plan doesn’t seem half bad. The devil desires a messiah who transforms the hard rock of suffering into the warm bread of blessing. Just give the people what they want, become the savior they desire, the devil says, and all will be well. Most of us would take this deal–the devil is an excellent salesman–but Jesus says no. As we quickly learn, God is calling his Messiah to a very different vocation. To proclaim the jubilee year of the Lord. The kingdom gospel of Jesus is good news to the poor, release to the captives, sight to the blind, the kind of jubilee-liberation where all the slaves go free. These themes were central to the life and preaching of the first generations of Christians, the people who gave us our New Testament. The church was an egalitarian community of slaves and free people, men and women, rich and poor, a rag-tag assemblage drawn from every tribe and kindred on the face of the earth. Their mission was to model the kingdom values that sent Jesus to a Roman cross: caring for the poor, welcoming the stranger, forgiving the enemy, breaking down the walls that fragment the human family. Which brings us back to the child wrapped in swaddling clothes, lying in a manger. The cute little tyke makes no demands. According to the song, he doesn’t even cry. He just lies there, cooing and looking adorable. O come, let us adore him . . . before he grows up and makes demands of us. 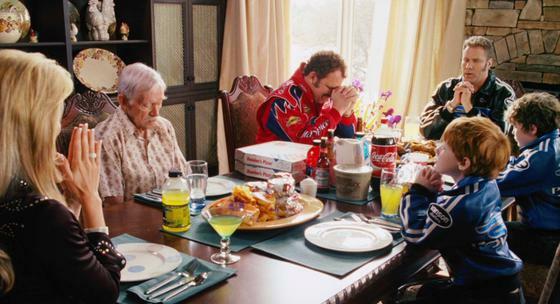 In the Ballad of Ricky Bobby, the successful NASCAR veteran prefers the little baby Jesus to the grown up variety, and since he wins all the races and brings home the bacon, he figures he can pray to whatever kind of Jesus he likes. Can we select the Jesus that suits our style, or are we stuck with the guy in the Bible who preached good news to the poor and release to the captives? The devil couldn’t buy a Messiah of his own choosing, and we can’t either. Thanks. Good reflection for me and all who are searching.